Evie Bloomfield here. 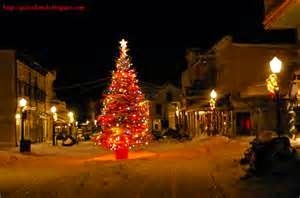 It’s my first Christmas and New Years on Mackinac Island. I could have chose to go off island and spend the really cold months with my parents and siblings in Chicago but there is a ton of work to do at the bike shop to get ready for next year. 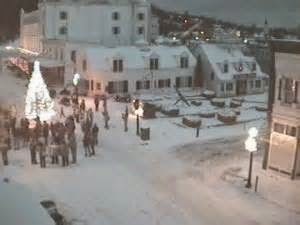 To get the season off to the right start we have the Mackinac Island Christmas Bazaar. To benefit the medical center that keeps us all happy and healthy. For three days people meet, talk, bid, eat, bargain hunt, and buy all for the sake of raising funds. The Friday before the Christmas Bazaar is the kick off with caroling, tree lighting and a hay ride in the middle of Main Street where the Christmas tree is placed. Almost all 500 of us permanent residents congregate to sing holiday carols which ends with a local child being picked to “throw the switch” and turn on the lights on the Christmas tree. After the tree is lit, a hay wagon arrives to take young and old on an old fashioned hay ride, where often the singing continues. The Rummage sale then opens for early birds to get first dibs on the best buys in the Mackinac Island Fire Hall. You see, with this being an island getting rid of stuff is tough so we sort of swap stuff around instead of tossing it out. And now the fun for the kids starts…all 65 of them that attend out schools and the younger ones too. On Saturday the community hall and fire barn open at 11:00 a.m. Lunch is served throughout the day and then Santa arrives. 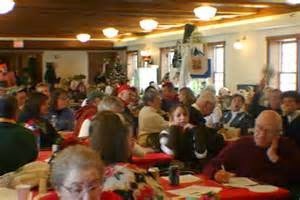 We wind up the day with a Prime Rib Dinner where we all get together in the town hall and celebrate being together. For New Years we ring in the event with the a snowshoe walk and the Great Turtle Ball Drop…’cause out island is shaped like a turtle. Then we head over to the Town Hall for live music and dancing. 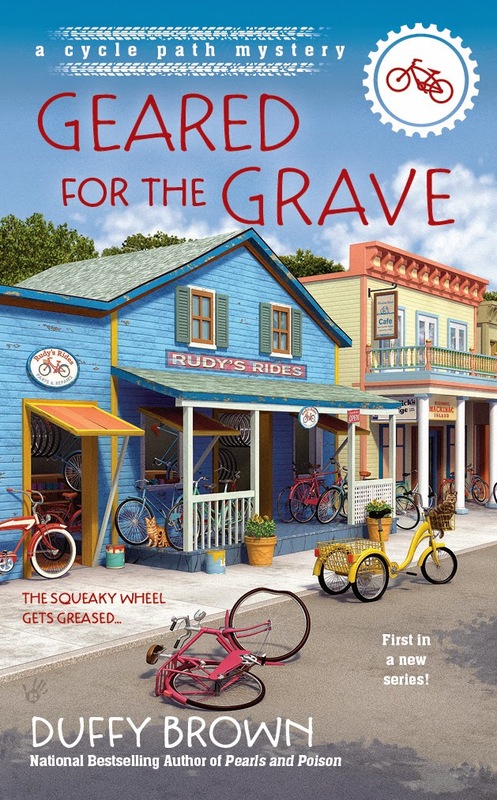 I’ll give away a copy of Geared for the Grave from the answers. Sending hopeful and healing thoughts to your granddaughter, Kiki. I am planning to welcome a new granddaughter to the family. 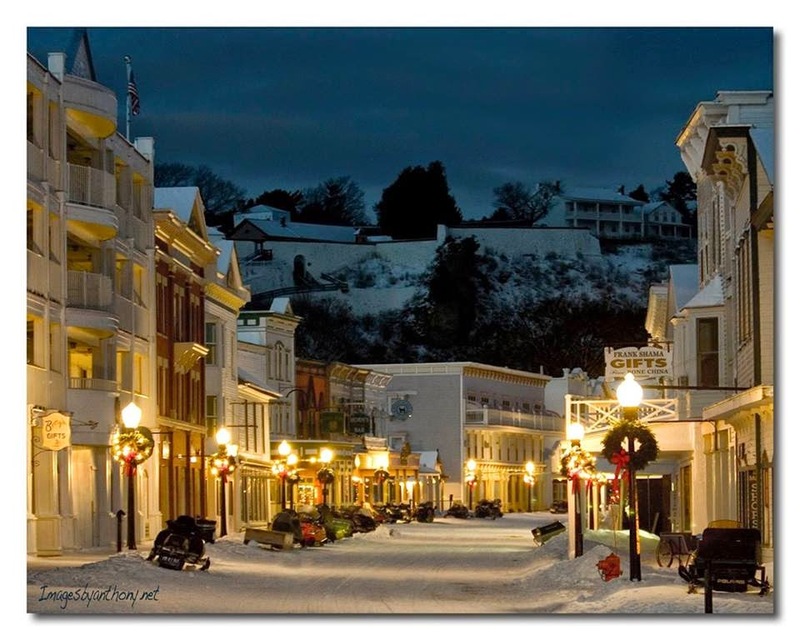 I bet Mackinac Island is beautiful this time of year! Hi, Elaine. 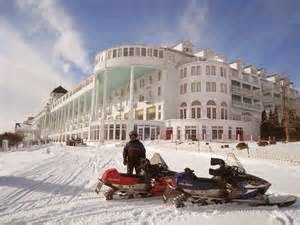 I bet MI is lovely in all that snow and who wouldn’t like a chance to drive a snowmobile. LOL Major congrats on the new granddaughter!!! Wow, many wonderful times ahead. I have been to Mackinack Island but only in the summer. I love it! Next year, I want to do some traveling. Hi, Debby. Travel is always fun to look forward to. Keep me posted where you go. Adventures ahead! My Niece graduates from college in May so I'll be going to that. Hi, Sandy. College graduation is always fun…the beginning of a new life. Have fun. First of all I loved the book! As for things planned for next year, hub and I will be celebrating our 10th anniversary so I know we will be planning a trip somewhere. Don't have any ideas at this time but out anniversary isn't until Sept so there is time to plan. I want to achieve simple things. Spending less time on my computer, more time outside smelling the roses. I want to put more effort into my journal and make some things for my dollhouse and, of course, read. I won't set myself any goals this year on Goodreads, I want to enjoy reading and not feel pressured to meet a target. I just want to enjoy the little things in life.I want to wish you a Merry Christmas and a Happy and healthy New Year! Hi, Chris! That you enjoyed Geared sure makes me smile. Thanks tons for letting me know!!! I'm having the closet in my craft room enlarged. I'm hoping to be more organized with my crafting supplies once I get everything put back into the closet. I have a trip to the Canadian Rockies planned for July. Other than that - just keep on keeping on. Oh, Mary, the Rockies!!!!!! What a trip! Lucky you!! Hi, Brenda. Thanks for the congrats and best of luck at the new language. Now you’ll have to travel to try it out! I am joining a health club on January 2. Membership is part of my new insurance plan, lol. In June, I am taking my daughter to Spain, with a group of students, from her high school. Hi, Annette! Wow Spain! What an adventure. Have fun and post lots of pics online. Sure wish my health insurace paid my gym membership. If they have Zumba give it a try. We are planning a trip to Michigan in August to the Dream Cruise. Hope to get back up to Mackinac Island. We were there for our Honeymoon and it was absolutely beautiful. I can imagine how gorgeous it would be in the winter with the snow and Christmas lights! Oh Jeannie! What a fun summer and to cruise sounds amazing. Hope you make it to MI and to have a Honeymoon there is fantastic. Lucky you. Sunny and warm sound amazing with so much gray outside right now. Have fun. No plans except to get some things done on the house that I've put off too long. Karen I am so with you. I need to glue this place together. I’m with you, Nicole. I’m going to enjoy my family more too. Bathroom renovations and taking my nephews to London and Paris and continue to count my blessings. By the way, i love Regan so I'm anxioius to get to know Evie. I just retired this year---so my plans are to relax and read plenty of cozy mysteries. Hi, Sue. Major congrats on the retirement. Lots of fun ahead. Enjoy! No definite plans but next year is our 20th wedding anniversary and we will be welcoming our first niece in March. I have little goals like finishing a cross stich project and organizing my office. We'll see. Hi, Daniele! Major congrats on the 20th and the new niece. I’m going to try and flyfish this year. Wish me luck. Happy birthday to your Mom! (in advance) And wishing her more birthdays in good health. Hopefully I can have my kitchen remodeled! And, it's time to start cleaning out the attic! Yeah! Like that's going to happen! A new kitchen!!!!!! Nothing more fun than that. Once you get done with your attic you can take on mine! Yikes! Hopefully I can get more organized this next year and spend more time with family. Nothing better than spending more time with family. Have fun!! I've taken knitting up again after many years and have made quite a few scarves. Now I want to learn knitting with circular needles and make slouch hats. A small goal, but exciting for me. Hi Nancy. My daughter loves those slouch hats…they are all the rage in NYC. It is exciting to try different things. Enjoy! Get out and take more photographs for friends & family. Hi, Jack. My daughter just got a new camera. Yes, lots of pictures. What a fun hobby! I hope to be in New Orleans for Mardi Gras. Well dang, Raquel. That sounds like a blast! Have fun! The only thing I have planned for next year is to take a trip to Orlando to visit my niece! I would love to take a vacation. Haven't had one in many years. Hi, Rita. And it doesn’t have to be far away…just a few nights someplace else to get away from it all. Hope it happens for you. Christmas with family and New Years a home. Love your contest. You are so generous. I would like to meet Duffy Brown in the new year. Possibly at a Nancy Drew Convention. I am going to try and make it. Would love to see you!! After this year, I just want good karma. I'm starting the year off with a very selfish and just for me trip to the coast for a week. I'm taking lots of books. Next year's plans: Sort out all the things in my basement and in our rented storage unit and have a garage sale to get rid of as much as possible. Many of these things are items from my Mother and Aunt's apartment. They moved into assisted living in October. Hope you get there, Alicia! Christmas on the island sounds great! Next year, I would like to take a trip to visit my brother and have some sibling family time. I’m trying to spend more time with family too. Nothing better. Sounds like a great place to me. I don't have any plans for the new year. Maybe I'll go to the library's next book sale when I find out when it is. Hi, Michelle. Library book sales are always a treasure. Great idea. Have fun. What fun! It sounds like a wonderful place to spend the holidays! I hope to get myself in gear and get more organized in the new year. I also intend to write more, read more, and have more fun! It sounds like such a wonderful place. I would love to experience it some day. I love this idea, Barbara. Plans for 2015 are sketchy at this time. One of the main aims is to get a new roof for our house. Another is to attempt to loose some of the excess weight I have gained. Lastly just to spend quality time with my family. In 2015 I plan to really enjoy retirement and reduce the tottering TBR stack. I retired last March but between major back yard remodel and 4 successful surgeries for my husband it didn't seem all that restful. Looking forward to sitting on the patio reading, reading, reading . . . and maybe taking a couple of trips to see our newest little additions to the family! I think I am too late for the giveaway... but oh I sure wish I could be at that rummage sale! This next year for me is going to be all about growing my business, getting me foot fixed, and getting back to it! I want to plan a trip to Germany or England. England especially because I love everything BRITISH, including reading books with a cup of tea in hand by a cozy fire. I have had dreams about England. That is first place I will go if I eveb get a chance togo to another country. 2015. I have my fingers crossed for one big thing I can't jinx. But other than that... I'd love to go to a magical place: Ireland and Mackinac Island. Continue working (love my job), read more cozies, stay up with my email.